Bick’s are the top line of pickle products in Canada, though the product has been made in the United States from 2012 onwards. As of 2010, Bick’s make 41 different products: pickles, relishes, and speciality items. 85% of the products are cucumber based. The pickles are fresh-packed: jarred within 24 hours of being picked, and covered in the jars with a pickling solution. In 1939, George and Lena Bick immigrated from the Netherlands to Canada. They bought a farm in the north part of Scarborough, Ontario, just outside Toronto. They called the farm “Knollview.” Highway 401 runs through the middle of it now, since the 1950s. George’s son was Walter Bick, who was 22 years old when they moved to Canada. Walter’s wife was Jeanny Bick. They had a boy named Eric. The Bicks had 117 acres on their Knollview farm. They grew grain and hay for their cattle, pigs and chickens, as well as cabbage, cauliflower and cucumbers for market. In the summer of 1944, the weather was warm and humid. The cucumber plants loved it, went mad and produced a glut of cucumbers. So, they dug out a family recipe for pickles from Holland, that George’s mother back in Holland had used. They made the pickles in 50-gallon barrels, which cured out in the barn, and started selling them to restaurants and army camps by the barrel. Their pickles were very popular, popular enough to become their full time business, so they sold off their cattle, chicken and pigs and focussed on the barrels of pickles. In 1951, they decided to pack the pickles into glass jars for the consumer market. They renovated a barn to hold the production. They packed 60,000 jars, all by hand. They pasteurized their products, right from the start. In 1958, the barn burnt down, so they built a modern purpose-built building. In 1960 Bick’s sold 12 million jars of products. At the time, they were producing 33 varieties of pickled products, including pickled onions, gherkins, and relishes including their Sweet Pickle Relish. In 1960, they introduced pimento-stuffed gherkins for their 10th anniversary in 1961. In 1966, they sold the business to the Robin Hood Canada flour company (which in turn was later bought by International Multifoods of Wayzata, Minnesota), land and everything. The Bick family said the business had just got too big for them to handle. In 2004, International Multifoods was purchased by the American company, J.M. Smucker. Smucker’s sold off most of the other products, such as the flours, but kept Bick’s. In 1998, the company opened a brining facility near Delhi, Ontario on a 73-acre farm with 600 vats, with each vat capable of handling 60,000 pounds of cucumbers. In 2001, Bick’s pickles had by then been produced at the Scarborough facility for 50 years. In November 2001, they moved production to Dunnville, Ontario in the Niagara Peninsula. The Delhi facility stayed open. Cho, Janet. J.M. 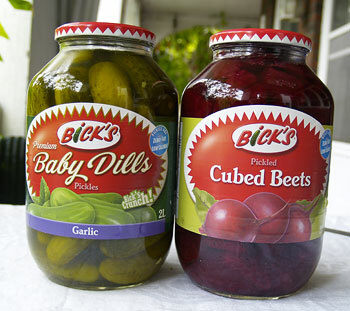 Smucker Co. to close two Bick’s Pickle plants in Canada in 2011. Cleaveland, Ohio: The Plain Dealer. 28 September 2010. Kearney, Mark and Randy Ray. I Know That Name: The People Behind Canada’s Best-Known Brand Names From Elizabeth Arden to Walter Zeller. Toronto, Canada: Hounslow Press. 2002. Laflamme, Nicole D.. Archives Coordinator, The J.M. Smucker Company. Email to CooksInfo.com. 27 September 2010. Sonnenberg, Monte. Smucker pulling out of Norfolk, Haldimand, closing Delhi and Dunnville facilities. Chatham, Ontario, Canada: Today’s Farmer. 30 September 2010.